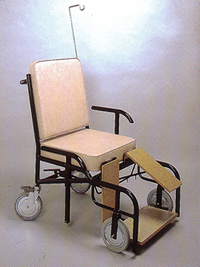 The Bolton porter chair is very popular in Accident and Emergency departments and Maternity wards. The Bolton chair is a very stable and comfortable portering chair with fixed arms, mounted on 200mm wheels at the front and 200mm braking castors at the rear. A large document pocket designed to take X-rays or medical files and full width tip-up footboard are standard fittings on the Bolton chair. Adjustable or telescopic legrests (please advise choice at time of ordering). As a result of its robust build it will give years of trouble free service and offer value for money. Additionally the Bolton chair is available in any colour you wish from the Just Colour range of flame retardant vinyl fabrics.